The weather in Ireland is always in flux—when traveling with kids bring a windbreaker or rain jacket just in case. There are no barriers at the edge of the cliffs so keep the kids close and stay on the concrete footpath. Check the tide times and aim to go as close to low tide as possible to enjoy the beach and rock pools. Go during spring or summer for milder weather. You wouldn't want your nuggets up on the cliffs or in the water when it’s too cold or windy. 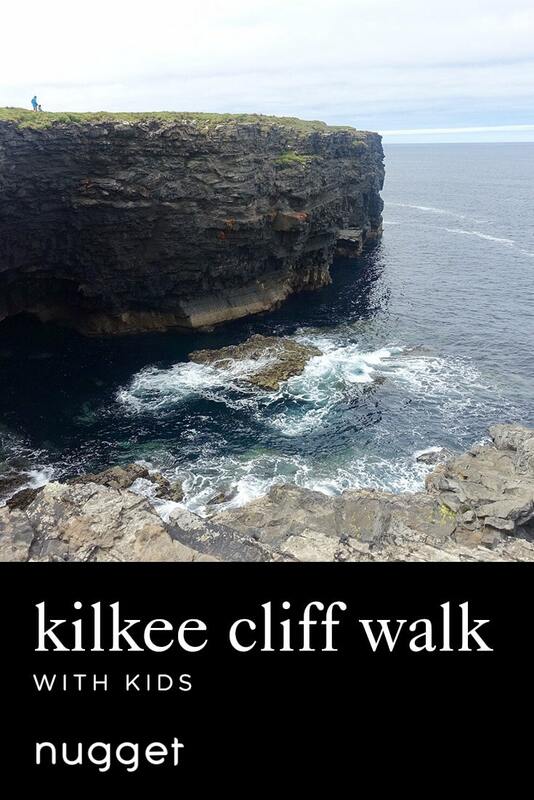 On a beautiful day, the Kilkee Cliff walk can't be beat—it caters to all ages and along with the fresh sea air, the stunning views will captivate everyone. Have an active day with the family and then treat yourself to some pizza, coffee and cake post-walk at the Diamond Rocks Cafe. After that, splash about in the rock pools at the Pollock Holes. You can easily spend a full day here if you stop by the beach as well. It’s the perfect day for outdoor loving families on a family vacation in Ireland. The close proximity to the beach and stroller-friendly paved footpath makes Kilkee Cliff walk a family favorite for locals. It's also free and not on the tourist tour trail unlike Cliffs of Moher which can get very crowded. It's a relatively flat and easy walk except for one steep incline (during which whoever is pushing the stroller will work up a sweat) with breathtaking dramatic views along the way. Our 3-year-old completed the cliff walk and loved seeing the cows and horses along the way. On a clear day, you might even see a dolphin from the cliffs! DIRECTIONS Drive to Kilkee and you’ll find ample free parking by Diamond Rocks Cafe at the west end of the beach (where they serve good food and drinks, and have changing rooms available). This is the starting point of the cliff walk. TIP Bring along your beach gear to make it a full day of fun! There are rock pools near Diamond Rocks Cafe and also Kilkee Beach is a short 3-minute-drive away. After completing the cliff walk, Pollock Holes is a lovely spot to paddle and play with water whilst waiting for the food to arrive at Diamond Rocks Cafe. DIRECTIONS The walk is circular, so you’ll end up back at Diamond Rocks Cafe. The rock pools are located right in front of it. TIP Bring your swim gear and toys! Be mindful of little kids as it is rocky and can get slippery. For a sandy experience, the beach is just a short drive away.